Xpress Series — Quality Van Sales, Inc. The Xpress is a simple and spacious shuttle bus at a nearly unbeatable price. 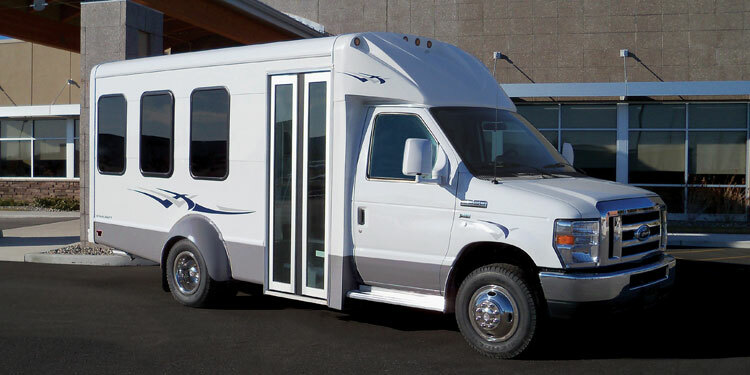 Whether you are looking to shuttle your hotel guests to and from the airport, looking for an excellent alternative to a 15 passenger van or need the versatility of a lift-equipped unit, the Xpress boasts a wide-entry electric door, over 6 feet of headroom, standard seat belts and a variety of standard features in five popular floor plans. Built on the tried-and-true Ford E-series chassis, the Xpress is durable and easy to maneuver. In fact, most floor plans do not require the driver to have a Commercial Driver's License. If you are seeking the simplest, safest and most efficient expression of transportation today, test the Xpress. It will move you... and your small group!